Old Fashioned is a cocktail that dates back to the eighteen hundreds. It is such a basic cocktail that a glass is named after it. It is also easy to make and delicious. I put the sugar in an old fashioned glass (a small tumbler). I shook 3 dashes of bitters onto the sugar. I added a teaspoon of water and stirred to dissolve the sugar. Add 2 ounces of a decent whiskey. This is not the place to go cheap. You should use a quality whiskey but don’t buy the most expensive, you will be mixing it. I went with Crown Royal as I like its flavour. 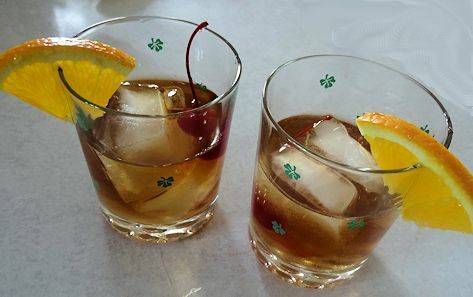 Add two ice cubes and garnish with a maraschino cherry and an orange slice. This is a great cocktail. It takes me back to the days when cocktails were strong and flavourful. You sat and sipped them with friends over conversation. If you want fizzy or sweet stay away. If you want whiskey with a touch of sour and a touch of sweet, make this and enjoy it. Put sugar into the bottom of an old fashioned glass. Shake 3 dashes bitters over the sugar. Add 1 teaspoon water and stir to dissolve the sugar. Add 2 ounces of whiskey. I have a friend that loves Old Fashioneds. Though instead of sugar he adds a little cherry syrup and a cherry from a jar of Amarena Toschi Italian Black Cherries in Syrup. He swears by it. Oh, that sounds great, wearenotfoodies. I will have to try it like that. 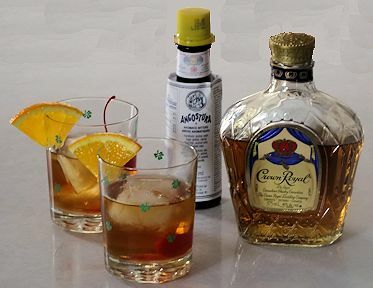 Decent is the key word, and you picked a great one “Crown Royal” Brings back many memories, as I haven’t had one for a long time. I’ll be right over!!! !